HOUSTON (Reuters) - The backlog of vessels waiting to move through the Houston Ship Channel grew on Monday while it remained closed to traffic for a third day as emergency workers attempted to clear a petrochemical spill from the Intercontinental Terminals Co (ITC) storage facility in Deer Park, Texas, the U.S. Coast Guard said. Thirty-one vessels waited to enter the busiest U.S. oil port on Monday, while another 31 waited to leave, up from 26, respectively, on Sunday morning. The seven-mile (11-km) section of the Houston Ship Channel from Light 116 to Tucker's Bayou remained closed, said Coast Guard Vessel Tracking Service Watch Supervisor Ashley Dumont. 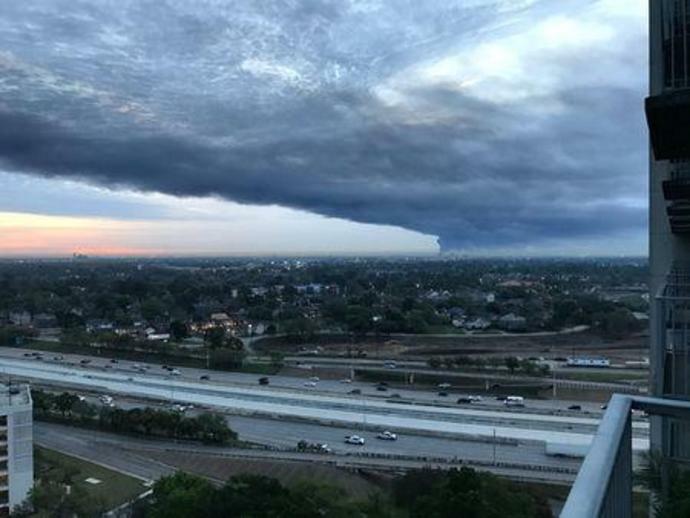 Fuels spilled after a 10-foot (3-meter) wide section of a containment barrier breached on Friday at Mitsui & Co Inc's ITC facility outside of Houston, sending fuel, water and fire suppressant foam to a waterway that connects Houston to the Gulf of Mexico. The Coast Guard opened the San Jacinto River to allow two-way vessel traffic for three hours until 12 p.m. CDT (1700 GMT)on Monday. The Texas Commission on Environmental Quality continued to assess the contamination levels in the channel. The Coast Guard did not have a timeline to reopen the port, Dumont said. The U.S. Coast Guard hopes to have traffic flow more frequently through the ship channel as it assesses whether it can be fully reopened. But as long as oil remains in the waterway and recovery operations are underway, traffic will move only during daylight hours, Captain Kevin Oditt said at a press conference. The TCEQ has had "limited results" from its sampling of water contaminants but plans to post its findings on its website and will soon review additional test samples, said Jeff Kunze, TCEQ's emergency response coordinator. The oil market's reaction to the ship channel closure has been muted, with Houston crude prices only "slightly weaker," because the vessel traffic is expected to resume soon, traders said. West Texas Intermediate crude at Magellan East Houston for April delivery, also called MEH, traded at a $5.85 per barrel premium to U.S. crude futures in early trade Monday, down from a $6.10 midpoint on Friday, traders said. "I don't think people expect this to be a prolonged issue," one trader said.